As a child of the '70s of course I was a Kiss fanatic! Kiss posters, t-shirts, magazines, vinyl albums and of course dressing like Kiss every Halloween. One of the first songs I learned on guitar was "Calling Dr. Love". I was too young to go to a Kiss concert until 1979, when I finally caught them on their last tour (for two decades) with the makeup AND the original members. Flash forward to the '90s. I was thrilled by the Reunion on "Unplugged", the reunion/farewell tours and the movie, "Detroit Rock City". I even bought my first Kiss record since the early '80s! But, I just couldn't force myself to pay those inflated ticket prices to see Kiss going through the motions. So, I settled for seeing a Kiss tribute band, STRUTTER at a local club. Let me tell you, once the show started, I was hooked. I felt like I was 15 again! Since then, I've seen a couple of Kiss tribute bands, and each one has been excellent. However, like Beatles tribute bands, the expectation level for the Kiss tribute band is very high. So, you can imagine the thrill when I found out that Atlanta now has its very own Kiss tribute band, called KISSTORY. I talked to members Jim Morrison (yep, that's his real name! ), Jeff Childers, Jeff Rich, and Kevin Gossage to find out all about Kisstory and the Kiss tribute band phenomenon. E.C. : First, what made you decide on a Kiss tribute band? I imagine that all you guys were in other bands before-is the tribute band thing, with a guaranteed audience, more satisfying than playing your own songs? Kisstory: KISS is what made us all decide to be musicians in the first place. This what we all dreamed of doing since we were kids. We saw KISS live on stage, heard the music and knew that's what we wanted to be when we grew up. E.C. : Last month I interviewed one of the Beatle tribute bands, and they mentioned the competition. Also, that other tribute bands would come to your show and "steal" ideas. Is this the case with Kiss tribute bands? Kisstory: As far as we're concerned, there isn't any other competition. We haven't seen ANY Tribute Band do our Childhood Idols justice yet!!! When we decided to do this, it was to be done right---or we wouldn't do it at all!!! 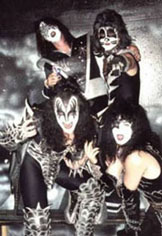 From playing the music, building the stage, and designing our costumes to looking like KISS, we also had to become them. We are taking this to an EXTREME------SOMEWHERE ITS NEVER BEEN BEFORE!!!! E.C. : Do Kiss tribute bands have to trademark their group names? I ask this because there is a Swedish Kiss tribute band with the same name, Kisstory. Kisstory: As far as we know there isn't any official permission, but we are registered at Kissonline. All we know we are promoting "THE HOTTEST BAND IN THE WORLD" and helping them to sell their albums, and loving every minute of it! E.C. : The Beatles company Apple tried, unsuccessfully, to squash the Beatles tribute bands. Do you have to get any special permission from the REAL Kiss? Kisstory: KISS is a real business minded band. They have to realize that we are helping keep the spirit of KISS alive. E.C. : I grew up a Kiss fanatic in the '70s (8-tracks in the car, air guitar "concerts" with my friends and of course Kiss make-up EVERY Halloween) but I've passed the last two final Kiss tours. I just couldn't see dishing out that kinda cash, especially when you can see a Kiss tribute band in just about every major city! Is there a real high level expectancy at your live shows? Kisstory: When we say "You wanted the BEST, You got the Best...", We solely intend to back it up! E.C. : I imagine that you have played, clubs, theaters and even Kiss conventions. What are some of the most memorable gigs you have played? Kisstory: Every show is special in it's own way. We treat each show like it's our first and last. E.C. : How did you study for the role, since there is a limited amount of "official" Kiss videos out there? Do any of you guys have acting backgrounds? Kisstory: We used "official and unofficial videos, and first hand knowledge of KISS since the 70's. E.C. : It was kind of a letdown to see the appearance of the real Kiss in "Detroit Rock City". I mean, it was obvious that it is not 1977 again! Don't you think they should have hired one of the tribute bands to do the final concert? Kisstory: Not unless it was us. We resemble KISS of the 70's more than KISS themselves do now. Kisstory: We do not concentrate on one time frame or era. We play hit songs and obscure good song that will make up an excellent show. E.C. : Finally, the real Kiss has been at it for almost 30 years before "calling it quits" (although we ALL know about bands and their so-called farewell tours!). How long will you guys be at it? Kisstory: As long as it takes to rule the world!! !